BMW says Chris Bangle (right) is leaving the company to pursue his own design-related endeavors beyond the auto industry. His replacement as BMW group design boss is Adrian van Hooydonk (left), who has been with BMW since 1992. Critics swarmed in 2001 when BMW unveiled the 7 series with its unconventional treatment of the rear deck lid. Not since Ford unveiled the doomed Scorpio at the Paris auto show in 1994 had a car created such a stir. Bangle calmly defended the 7 series. You have to be a little different sometimes, he said at the time. 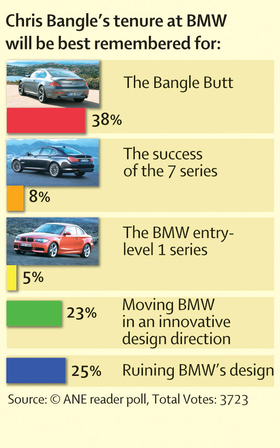 Three years later, Bangle was asked by Automotive News Europe about the events that led to the launch of the upper-premium car. You never heard the word emotion coming from designers like you do now, Bangle said. The car also was being crafted as fears were rising that the Y2K computer bug was going to cause massive chaos. There was a fear of technology, a fear of change. A fear of moving forward is naturally a part of a century change, he said. With its iDrive controller system and its sculpted exterior, the 7 series was quite honestly a large jump for the company, Bangle said. The rear design was softened a bit on the face-lifted 7 series that followed, but perhaps it was Bangle who got the last laugh. Not only did the car sell in greater numbers than the previous generation but the rear styling of the succeeding Lexus LS and Mercedes-Benz S class appeared to follow a trend set by the 2002 7 series. Bangle, a graduate of the Art Center College of Design in Pasadena, California, spent most of his career in Europe. He began at Opel in Germany, then joined Fiat in 1985. 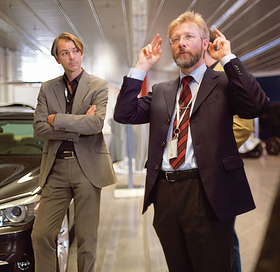 In 1992, he moved to Munich as BMWs design chief, the first American to hold that job.